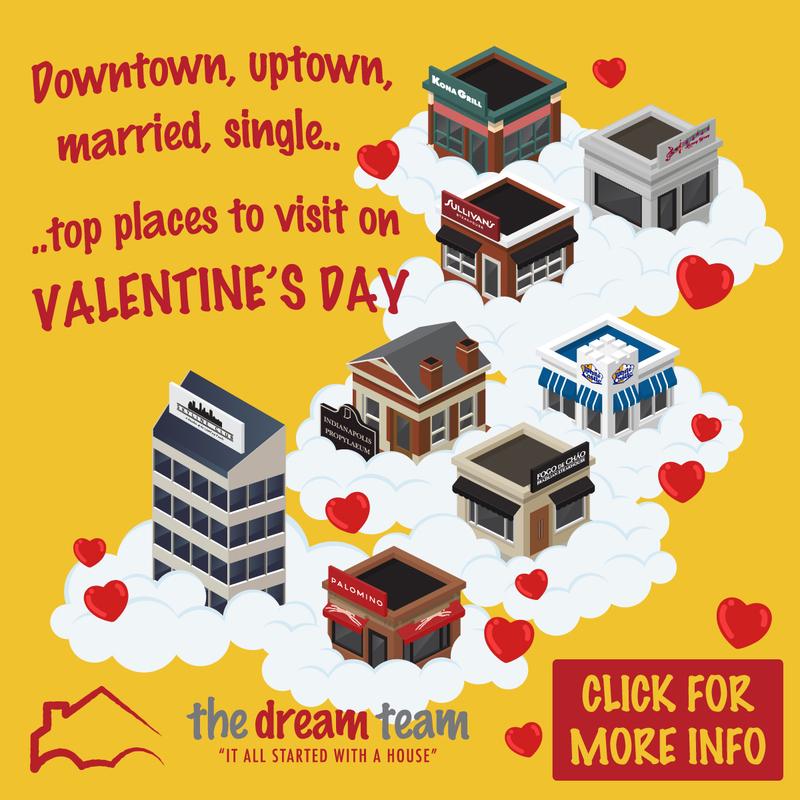 Happy Valentines Day from The Dream Team Realty! We want to help you take the guesswork out of deciding where to celebrate this year. Below is a compilation of some of the best deals in Indianapolis. Act quickly though…reservations and registrations book up fast! Click the title to go to the reservations for each location. Dinner, live music, a champagne toast, and a rose for the ladies. $75++ Per Person. C/C required to hold. Tell your server that The Dream Team Realty sent you & receive a free dessert, in addition to any special Kona Grill decides to offer on Valentines Day. when you purchase your Valentines Day meal at full price. Those who prefer a more casual meal can head to White Castle on Valentines Day for dinner with table side service. for reservations, call (317) 269-4590 or visit whitecastle.com. Entrée choices are required to make reservations. Join us for a Romantic Valentines Day Dinner as we transform the Winery into a cute Italian Trattoria complete with Red check tablecloths, candles and romantic music. Our 3 chef-prepared dinner this year is by Chef Joe Quinn, Chef Joe Mason and Dessert chef Kelly Quinn. They will be preparing the 6 course meal paired with our delicious wines. Grab your sweetie (or a running buddy) and join us for a fun run downtown! Celebrate your Valentine weekend with a 5K through a beautiful course near Mass Ave! Much of the run is along the Cultural Trail. Cupcakes (provided by Pat A Cake and Cookies Too) for all participants as well as a finishers medal and fleece blanket swag! There will also be a few random prize winners so be sure to check out those prizes and listen for your name! Are you flying solo on Valentine’s Day this year? Do you love to cook? Come join master chef Jenny Fox and be led through the creation of several delicious Italian dishes, in person! The class is taught Tue, February 14, 2017 6:30 PM – 9:00 PM EST. The cost to register is $35 per person. She will then send you a paypal request for the registration fee.